From the Potomac: Are the Caps Losing the PR Battle over Ove? Right now, the Washington Capitols are the hottest ticket in Washington. The Caps are in first place in the National Hockey League’s Eastern Conference. 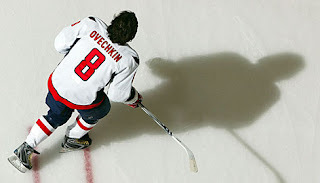 They have arguably the best player in the game, Alexander Ovechkin (also known as “Ove” or “The Great Eight” after his jersey number), back on the ice after a two-game suspension for a recent hit on Brian Campbell of the Chicago Blackhawks (video here), the end result of which left Campbell with a broken clavicle and broken rib. That suspension and Ovechkin’s play overall have been the subject of much debate in D.C. and throughout the hockey world. The two sides of the argument break down to whether one thinks Ove’s a talented and enthusiastic young star who brings fresh energy to the game or an Eastern Bloc thug who pursues his opponents with malicious intent. I’m a Caps fan, so I think the former is more accurate than the latter, but I am beginning to wonder if the Caps aren’t losing the PR battle to define Ove’s career. The goal, when communicating in a stressful, emotionally charged environment (say, with sports fans who have just seen a superstar injure one of their team’s players), is to establish trust and credibility. Right now, outside of their fan base, I don’t think many people trust the Caps when the team says that Ove is a good guy who plays hard, or that “The Great Eight” has much credibility when he expresses how sorry he was that Campbell got hurt. Just look at the coverage that Ovechkin gets in his hometown paper or in the broader sports media. It’s a way for Ove to serve the hockey community through action, rather than just an apology. I understand that the Caps are in the middle of a playoff chase, questing after the Cup that the team’s star (and owner Ted Leonsis) wants to win so desperately. And maybe, if that quest is successful, none of the PR bumps along the way will matter much; winning solves just about any problem in professional sports. But I get the sense that the Caps’ organization desires more than just the fleeting thrill of a world championship. The team, from Leonsis on down, wants to be a part of the soul of Washington. To turn that aspiration into a reality, the team needs to get smarter about managing the perceptions of its best player.